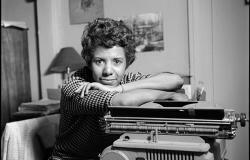 Award-winning filmmaker Tracy Heather Strain examines Lorraine Hansberry’s life and work using a remarkable collection of archival footage, home movies, rare photos and unpublished documents. Hansberry’s “A Raisin in the Sun” (1959) changed the face of American theater by depicting the limitations of the American dream through the lives of a black family on Chicago’s South Side. The play’s richly drawn characters and unprecedented subject matter attracted record crowds and earned it the coveted top prize from the New York Drama Critics’ Circle. The film features interviews with Hollywood legends such as Sidney Poitier, Ruby Dee, Harry Belafonte, and Louis Gossett Jr., narration by award-winning actress LaTanya Richardson Jackson, and the voice of Tony Award-winning actress Anika Noni Rose as Hansberry. The result is a timely and revealing portrait of an activist and artist whose popular recognition has, until now, remained long overdue. American Masters – Lorraine Hansberry: Sighted Eyes/Feeling Heart premieres Friday, January 19, 2018 at 9 p.m. on WXXI-TV. This documentary is part of American Masters’ year-long online campaign supported by the Corporation for Public Broadcasting, #InspiringWomanPBS, based on themes central to the lives of Dr. Maya Angelou and Lorraine Hansberry: artistic expression, academic success, active community engagement and acceptance of difference. People can share stories of inspirational women in their own lives via text, images or videos at pbs.org/inspiringwoman or via Tumblr, Twitter and Instagram using the hashtag #InspiringWomanPBS. A video compilation series of the best submissions are featured monthly as PBS and American Masters Instagram Stories.